Another Fetish Fixation 69er! It looks like Fetish has made their labels stand out more by filling them in. I am not sure whether or not I like this. I guess for $150 clams you really can't be choosy. 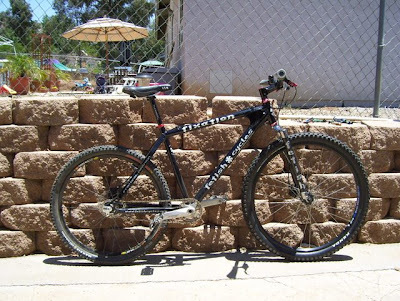 Found this the other day on the SoCalTrailriders forum, a rigid Fetish Fixation 69er! If you look closely, there is a bell on the the left side of the handlebar. I am not sure I believe the point about pot holes. I was ridding my Qball the other day on the Gussy Trail and it's still pretty much a raw trail and really uneven in most parts. Even with squish in the front, some of the holes on the trail, which are comparable to a New York City pot hole were still sorely felt. The price isn't bad, unless of course you have to replace the crank arm. Brand new, this bike costs $399 at Bikes Direct. This has to be the cheapest 29er I have seen being sold to date. I'd check it out and if you got it for $150, that would be pretty sweet. 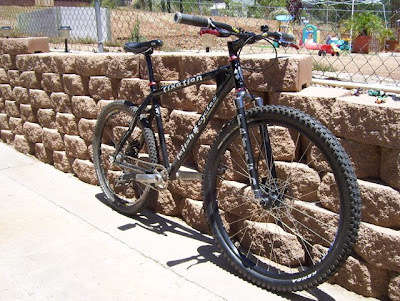 Good, cheap way, to see if you have the stomach (and back) for riding rigid. Here is another 29er from NYC. Of course, I don't understand why someone would spend $1100 on bike and not ride it. Maybe it's legit but in the first four months I had the Qball I put 102 miles on it and in 2007 another 183 miles. I just don't understand how you can by a 29er and not ride it.